Daughters of the Khalsa will not blog articles for a period of time. However, Thanks to the cooperation of Kaurs United and Daughters of the Khalsa Blog, both will team up to present Kaur Singhnee Gataka Project. This includes articles of Bibian Shaheeds who used Gataka in battle and Modern Day Singhian who practice Gataka on a daily basis. The project is still under construction, so please continue to visit the Daughters of the Khalsa Blog for updates. Thus, while Kaurs United and Daughters of the Khalsa Blog complete the project visit Kaursunited.org or read previous posts on Daughters of the Khalsa. Kaurs United is a non-profitable organization run by Sikh women to strengthen the spiritual lives of Sikh women around the globe in a challenging, motivating, and exciting environment. Kaurs United aims to provide long-term support for Sikh women to improve their lives by increasing their faith, self-esteem, and willpower. 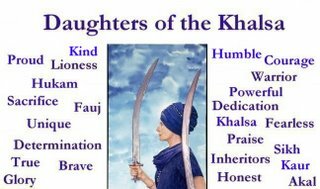 Daughters of the Khalsa Blog is dedicated to the sacred, gracious and benevolent memory of fearless SIKH WOMEN of the KHALSA PANTH who suffered in-humane tortures for freedom and faith and are an inspiration to us all. As well, Daughters of the Khalsa Blog is determined to develop spirtitual lives of sikh women around the world by illustrating the lives of our Khalsa mothers, sisters, and daughters. May you continue to be blessed and remain in chardi kala! Bhenji, daas was wondering which program you used to create the video you put up in your previous post. If you would let daas know, daas would be grateful. maaf karna Ji, comment was sent before daas could complete it.